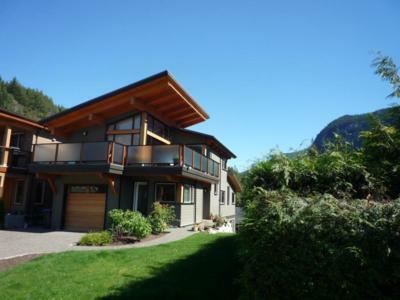 Chiefview Chalet is a newly completed contemporary timber frame home perched atop Hospital Hill bluffs near downtown Squamish. 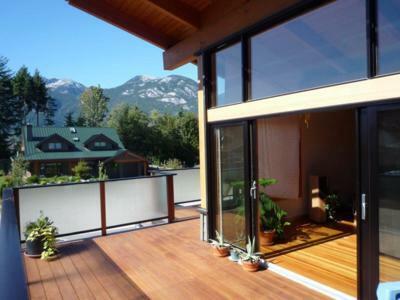 Panoramic views of the Squamish Chief and all day sun illuminate and warm the open concept living space and south facing deck. 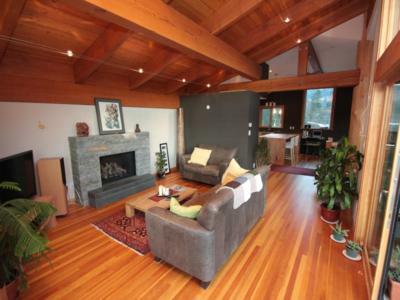 The home beholds many finely hand crafted features such as the 30 foot central cedar tree post, hand hewn stone natural gas fireplace and timbered living room roof. 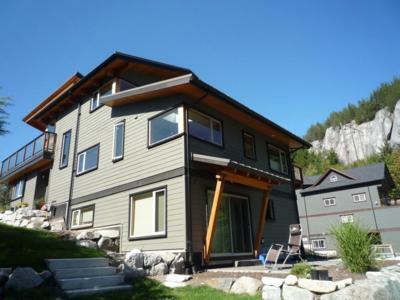 The shops and services of downtown Squamish and the Squamish Adventure Centre are a 15 minute walk away through the Smoke Bluffs Climbing park and the Pennylane climbing area and bike trails are a mere 100m from the front door. 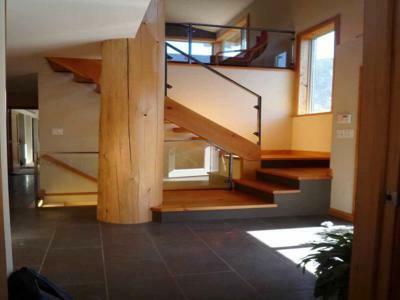 Upon entering the foyer the visitors eyes are first drawn up the double height entry area by the large cedar post captured by timber stairs and custom steel and glass railing. Off the main floor entry foyer is the front den/home office and hallway leading to main bath, 2 bedrooms and the master suite. 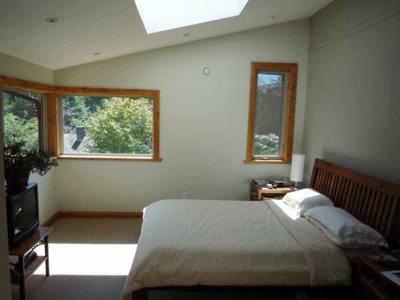 The morning sun awakens the master suite with views of the Stawamus Chief and Squaw from both the bed and 6 soaker tub. 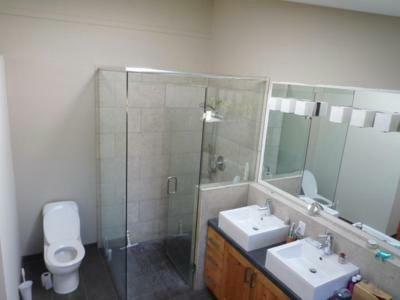 The ensuite also hosts double sinks and a large walk-in all glass shower with skylight. 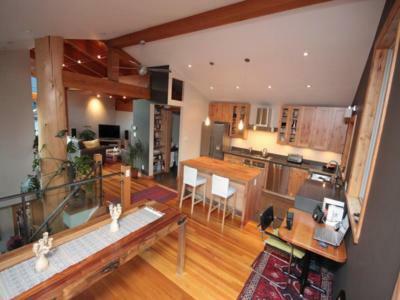 Upstairs the open concept living area and many windows capture light and views from all sides. The kitchen features all stainless Fisher & Paykel appliances including gas cooktop, Miele dishwasher, quartz counters over custom hand built cabinets with a farmhouse sink. 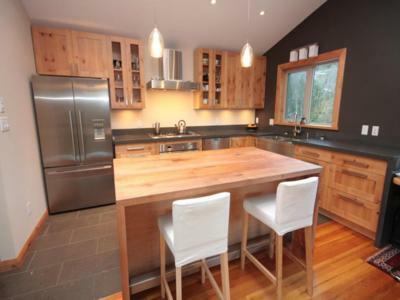 In the centre rests a maple butcher-block island with microwave. The powder room/pantry separate the kitchen from the central feature of the house, the living room with it s timber frame roof, cable lighting, 46 inch LCD home theatre and contemporary stone fireplace. 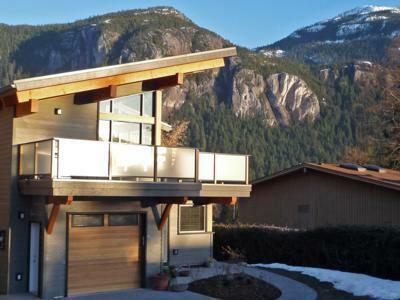 The floor to ceiling windows and 12 foot sliding patio door lead out to the large south facing deck with the most magnificent views of the Stawamus Chief. The large roof overhang offers protection from the elements and comfortable place for year round grilling on the stainless steel BBQ. The ground floor of the house holds the laundry area.